*Rotation of donguri (acorns). "Gururin" means rotation. Rings of donguri appear to rotate. Blue frames that form squares appear to be misaligned at the borders between red and green. I imagine some people do not see this illusion. In addition, the Hermann grid illusion and von Bezold's chromatic assimilation can be observed. The ring appears to approach. Moreover, the ring appears to rotate when observers approach or move away from the figure while fixating at the center. Furthermore, the color of the ring appears to be different when approaching and when moving away. Cushions appear to expand. These figures consist of squares or rectangles. Round objects appear to move around the squares slowly. A black hole appears to approach you. The cheeks appear to move. There is luminance modulation on black stripes, not on white stripes. The perception of misty spirals is due to white phantoms. Illusory black dots abruptly appear or disappear in white circles when we see the figure freely (= the scintillation grid illusion*1). On the other hand, the white circles disappear when we fixate at the center (the vanishing disk illusion*2,*3). --- It should be noted that actually the third author Elke Lingelbach discovered the effect. Institut fur Augenoptik Aalen --- Click "Tauschungen" (illusions). Ninio, J. & Stevens, K. A. (2000). Variations on the Hermann grid: an extinction illusion. Perception, 29, 1209-1217. McAnany, J. J., & Levine, M. W. (2004). The blanking phenomenon: a novel form of visual disappearance. Vision Research, 44, 993-1001. The checkerboard is vertical or horizontal but appears to tilt. Parts of the figure appear to move. Although the blocks are aligned vertically, the figure appears to show curves. The figure appears to bulge out, even though all the squares in the figure are equal. 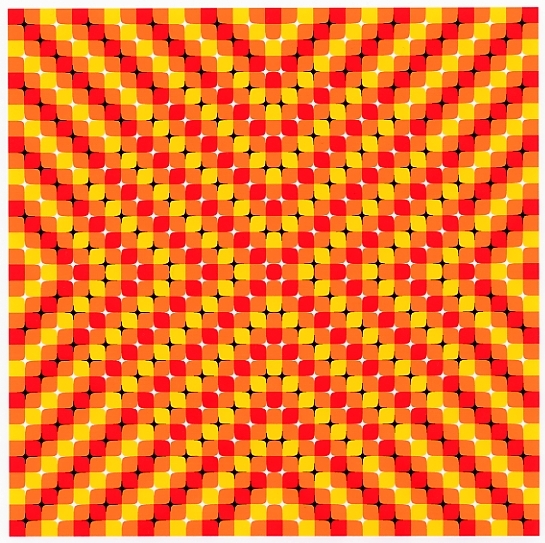 Moreover, part of the figure appears to move. The inside red appears to be purple-red. The center block and the flanking blocks appear to move relative to each other. Squares appear to be distorted and the whole figure appears to wave.